To set an alias for an object or derived table in the query, you can right click at the object and select the Properties item from the context popup menu or you can double-click the object header. 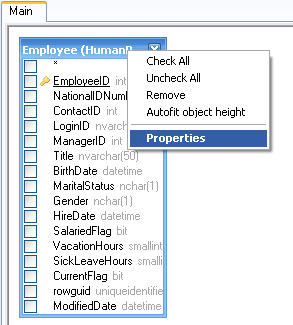 The Datasource Properties dialog will appear. The Datasource Properties dialog may contain other server-specific datasource options, but the Alias property is the same for all database servers.